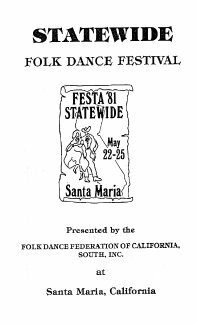 Audrey Silva and her committee did such a good job in 1975, Santa Maria was a unanimous selection for the 36th Annual Statewide Festival, "Fiesta 81," May 22, 23, 24, and 25, 1981. Headquarters hotel was once again the Vandenberg Inn although some of us had a liking for the Turtle Inn and their fine pool. The Friday Pre-Party was held at Veteran's Hall and the Institute Saturday afternoon at Hancock College Gym. The Saturday evening program was in Veteran's Hall. Sunday morning we met at Vandenberg for the Installation Brunch, with Vivian Woll as Chairperson. President Dave Slater of the South and President Frank Bacher of the North installed the new officers. There will be no Past President's pin presentation as both presidents will serve another term. The Concert was held Sunday afternoon at Santa Maria High School, the Chairperson being Maria Reisch. My file on the Concert is incomplete so I cannot go into detail but it measured up to what we have come to expect from the Concert. Good! Following the Concert there was dancing at Hancock Junior College and at Veteran's Hall during the evening. All After Parties were held at Veteran's Hall, the dancing kind I mean. But all before and after parties were not for dancing, such as the President's Party and that midnight get together put on by Don Spier, and if you are not on his invitation list, better get there pronto. We sort of take these smooth-running Statewides for granted but the reason they go so well is due to a few dedicated people who work long and hard to make sure you and I have a good time. For those Committee members not already mentioned I want to acknowledge a few to whom we owe a lot: first and foremost Chairperson Audrey Silva and her Los Angeles Co-ordinator Dorothy Daw; Dance Programs, David Slater; Decorations, Sally Martin and Helga O'Brien; Sound Equipment, Ed Feldman; Masters of Ceremonies, Valerie Staigh; Publicity, Pearl Bleadon; and a lot more. 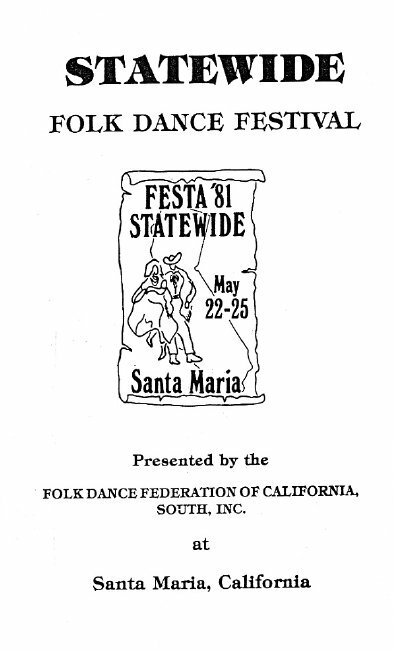 There are usually many other fine things that happen to one when they visit Santa Maria. For one thing, they specialize in barbecue steaks and some of the best restaurants you will find anywhere. Of course they have weather you can't beat and some fine beaches. And then you have Audrey Silva and her husband Joe who puts up with her. She is probably the busiest gal in Santa Maria.